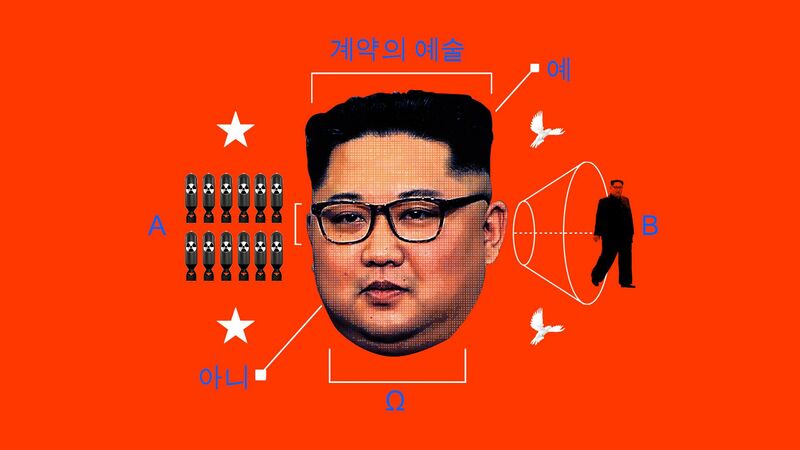 Over the past decade, allied intelligence agencies have pieced together a profile of the young Kim Jong-un from extensive interviews with teachers, students, food preparers, and other staff at the elite Swiss school that Kim attended during his adolescence, according to a source who has carefully studied the classified binder on Kim. "The picture that emerged from literally dozens of interviews bears a striking similarity with the man he has emerged into today," the source said. "Gluttonous, prone to fits of anger and swaggering around his classmates. Kim Jong-un was an in-attendant student but demanded slavish loyalty from other children in his wake." "He was prone to violence,” the source added. “He had a couple of young guys who were with him" at the Swiss school, and "he hit them frequently." "He didn't do well in school. He was distracted a lot." The binder describes the young Kim making vague and grand declarations to his classmates — for example, after games he would say, in the source's recollection, "some day you will all remember me." Why this matters: In his intelligence briefings, to prepare for his historic summit in Singapore, President Trump has shown intense interest in the personality and quirks of the reclusive Kim, according to sources familiar with his preparation. Trump "definitely thinks it’s a duel of personalities," a source who has discussed North Korea with Trump previously told me. Trump has been quizzing Secretary of State Mike Pompeo about what Kim was like when the two men met. The president also has access to far more detailed psychological and personality profiles of the dictator. "There are important strategic considerations ... but he also very much conceives it as a test of wills and of a contest of one man and another,” the source added. “How they’re going to react, how they’re going to shadow box with each other, and ultimately how they’re going to choose to act." In their bilateral meeting in the White House's Cabinet Room, on April 24, Macron said to Trump, "Let’s work together, we both have a China problem," according to a source in the room. The source said Trump responded that the European Union is "worse than China." Trump also says that America has a fairly balanced trading relationship with France but that the U.S-European trading relationship is very unfair. I asked White House Press Secretary Sarah Sanders, who was also in the Cabinet Room for this Trump-Macron meeting, about this exchange. She told me: "The broader point of the conversation was them wanting to work together to do something to fix the system." Trump himself has acknowledged as much, playing down expectations in his public statements and describing this as the first of a potential series of meetings designed to thaw relations and ultimately denuclearize the Korean Peninsula. Some experienced North Korea analysts believe hardline elements within the North Korean intelligence apparatus have been opposed to the idea of the summit between Kim Jong-un and Trump. Between the lines: One source said Kim Jong-un's decision to send the former spy chief Gen. Kim Yong-chol to the U.S. was likely designed to signal to any internal skeptics that he's taking a tough-minded approach. The U.S. intelligence community believes Kim "has been the mastermind of some of North Korea's most nefarious recent activities," said the source, who has studied the U.S. intelligence assessments of Kim. The source said these nefarious activities include the 2010 sinking of a South Korean Navy vessel — by a torpedo fired from a North Korean submarine — which killed 46 sailors. Behind the scenes: Kim Yong-chol had never visited the West before his recent trip to New York and Washington, the source said. Part of Mike Pompeo’s plan was to show Kim what's possible and how far behind they are, economically. When they met in New York, Pompeo showed Kim sweeping views of the city. President Trump is in Singapore, for the historic summit with Kim Jong-un on Tuesday. The White House is not releasing the president's weekly schedule beyond that. The House "begins work to pass over 70 bills from eight committees to fight our nation’s opioid crisis," according to a senior leadership aide. The Senate will spend the week debating the next year's defense bill — the National Defense Authorization Act (NDAA). "There is A LOT of focus on and congressional reaction to Trump’s decision to impose the steel and aluminum tariffs on our allies." "Senate Republicans will have an internal battle on trade and the role of Congress (something that used to unite Republicans) when they consider Sen. Corker’s legislation (if McConnell allows it to get a vote.)" "While much attention has been on the 232 tariffs (steel and aluminum), the business community is anxiously awaiting a big reveal this week when the Trump Administration releases its final list of the Sec 301 tariffs (the $50B U.S. tariffs on Chinese imports). Announcement expected to come by Friday." "What to watch: Free trade is a DNA issue for Republicans. Many congressional Republicans split from Trump on the steel and aluminum tariffs and spoke out in support of our allies last week. It will important to see whether those voices will be just as loud this week when the administration imposes another set of tariffs..."
For more than a year, United by Interest — a majority-minority-owned bipartisan lobbying firm — has been working on a plan to unite the bases of both parties to rally behind an infrastructure bill that would invest in America’s poorest communities. The bill will be co-sponsored by Pennsylvania Republican Rep. Mike Kelly; Democratic Rep. William Lacy Clay Jr., a member of the Congressional Black Caucus; and Republican Rep. Ted Budd from the ultra conservative House Freedom Caucus. The details: According to sources involved in the bill's drafting, the legislation would require the Department of Agriculture to sell its distressed debt assets, estimated to be worth more than $50 billion. The money gained by selling off these assets would be divided in two: half would go to paying down the national debt and half would go to "funding much-needed infrastructure projects across the country in communities below the poverty level," according to a source familiar with the bill. "The bill is considered a pilot program," the source added, "and if successful, the members behind it are expected to introduce additional legislation that would call for other agencies to sell off their distressed debt assets to fund additional infrastructure projects and continue to pay down the debt." Rep. Kelly, the bill's lead sponsor, told Axios: "Even in this time of historically strong economic growth, some of our country’s poorest communities are still waiting for significant infrastructure improvements." "This unique piece of legislation will directly benefit them and lift up their economies without raising taxes or adding to the deficit. It’s win-win-win." The politics: Sam Geduldig and Michael Williams, of United by Interest, say the bill appeals to conservatives because it shows a "possible path to paying for infrastructure projects, without having to raise the gas tax." And it also appeals to liberals because "the infrastructure projects the bill would pay for would be in communities below the poverty line, which largely happen to be African American, Hispanic and rural white communities." McConnell has used "scheming, strategizing and tactical maneuvering to win five reelection campaigns and rise through the ranks." His tenure: 11 years, five months and 10 days.